Sand Run Falls in Tioga State Forest. There are a few ways to hike to Sand Run Falls, but the easiest is along the Mid State Trail. 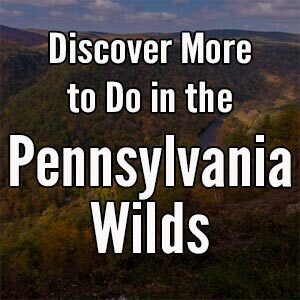 The Mid State Trail runs 325 miles across Pennsylvania, and passes directly next to the parking area for Sand Run Falls. To get to the waterfall, you’ll be hiking on this orange-blazed trail for approximately three miles. Along the way, the trail passes through a beautiful forest. You may also encounter areas of the trail that are quite boggy. While this makes the hike a bit more of a challenge, it’s also a good sign, as this means that the waterfalls at the end are flowing nicely. Hiking along the Mid State Trail to Sand Run Falls. After hiking for about three miles, you’ll come to a turn in the trail. At this point, there is a sign pointing to the right towards the waterfall, which is also the continuation of the Mid State Trail. If you continue to the left, you will follow the red-blazed Sand Run Falls Trail away from the waterfall. From this split in the trail, it’s a short distance to the top of Sand Run Falls. The Mid State Trail cuts directly across the top of the waterfall, which seems quite dangerous, especially during times of high water. Don’t miss this split in the trail of you’ll miss the waterfalls. 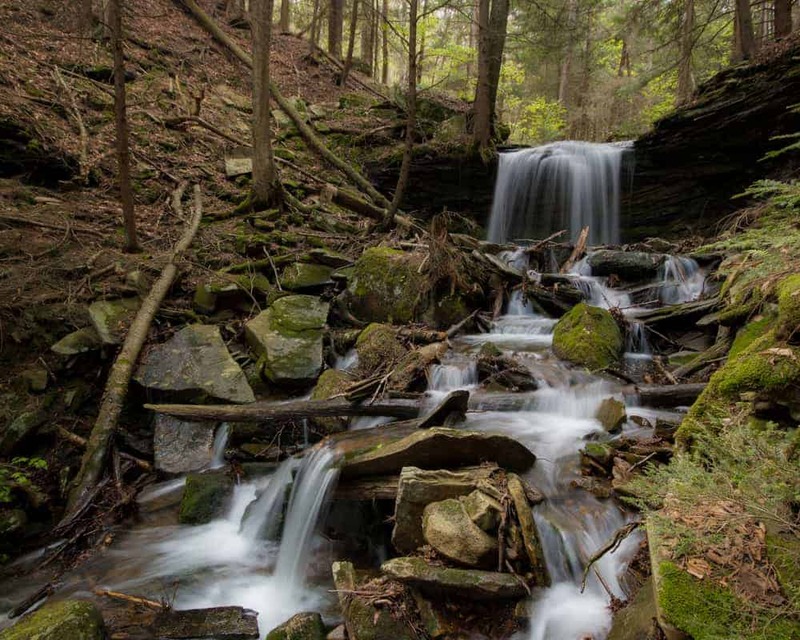 It’s possible to get a nice view of Sand Run Falls from this vantage point, but the best points are at stream level. To be honest, there’s no real easy way to get down to the bottom of the creek, as all options are rather steep. It’s best to simply choose the one that looks best to you on the day you visit and carefully make your way down to the creek. 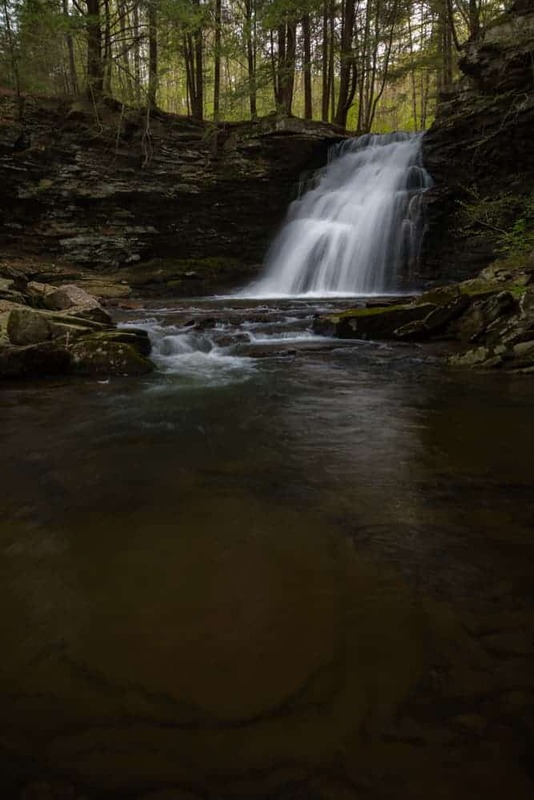 Sand Run Falls is located about 100 yards upstream of where Sand Run meets Babb Run. During times of high water, these can both be impressive waterways. 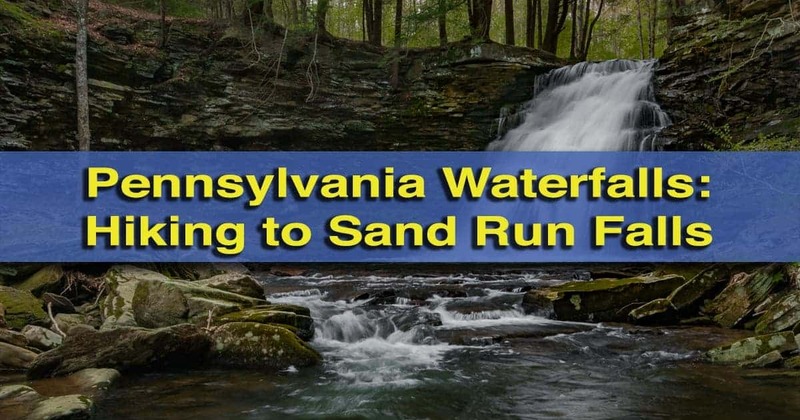 Unfortunately, to get a close look at Sand Run Falls, a stream crossing is required. During times of low water, it’s probably possible to do this without getting your feet wet. However, if you are visiting when the waterfall is flowing well, your feet will get wet. Looking upstream at Sand Run Falls. 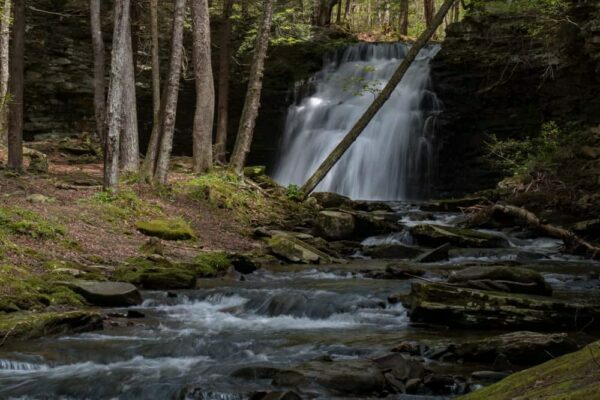 Next to Sand Run Falls might be the most scenic campsite in Pennsylvania. Note that this is an official state forest campsite and a free permit must be obtained before camping here. Still, the man-made benches offer a nice place to sit for a spell and enjoy the beauty of the area. Most people who make the hike to Sand Run Falls spend a bit of time enjoying this waterfall and then head back. However, there are three other waterfalls nearby that are worth checking out if water levels are high enough. This unnamed, seasonal waterfall is located a short distance from Sand Run Falls. The first is just around the corner from Sand Run Falls. This unnamed stream enters Babb Run just a few yards downstream from where Sand Run ends. Less than 100 feet up this unnamed waterway is a small, 10-foot waterfall that can be quite photogenic. If this unnamed waterfall is flowing, there are two others that are worth checking out. To see them, you need to head upstream for a few hundred yards on Babb Run. I made the mistake of going straight up the stream when I visited, only to find out that there is a trail that takes you right to the top of the first one. 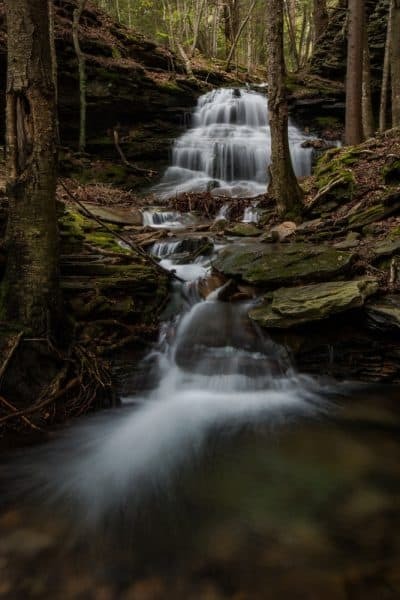 Another look at the unnamed waterfall near Sand Run Falls. To get there, notice the steep trail with a large rope near the campsite. Use the rope to help you climb the hill and follow the trail over the hill and back downhill. Within just a couple of minutes, you’ll come to the top of a small, but very beautiful waterfall on Babb Run. The third waterfall is the hardest to see, but worth it if you can safely cross Babb Run. The trail continues on the far side of Babb Run, but you don’t want to follow it for far. 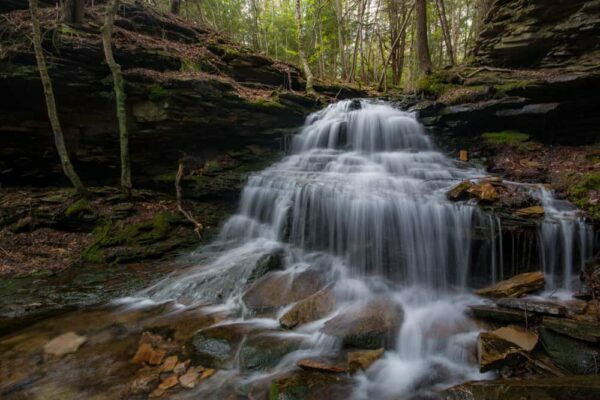 This small waterfall is located on Babb Run just upstream of Sand Run Falls. Rattlesnake Run enters Babb Run at this small waterfall. The trail will climb away from the streams, but you’ll want to pick your way upstream on Rattlesnake Run for a short distance. 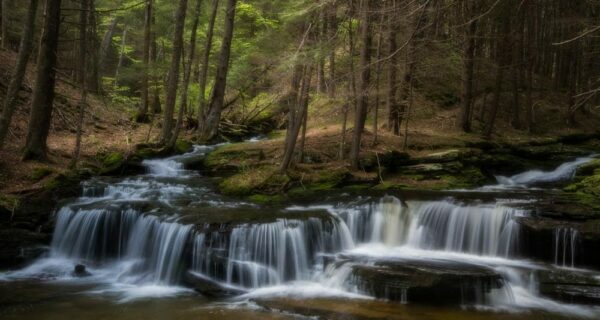 Less than 100 yards upstream, there is a beautiful 10-foot waterfall that I’ve creatively dubbed Rattlesnake Run Falls. While a good storm is needed to clean out the mess of branches below this waterfall, it’s still quite beautiful to see. Rattlesnake Falls is hidden, but worth finding. Once you are done enjoying this last waterfall, make your way back to Sand Run Falls. 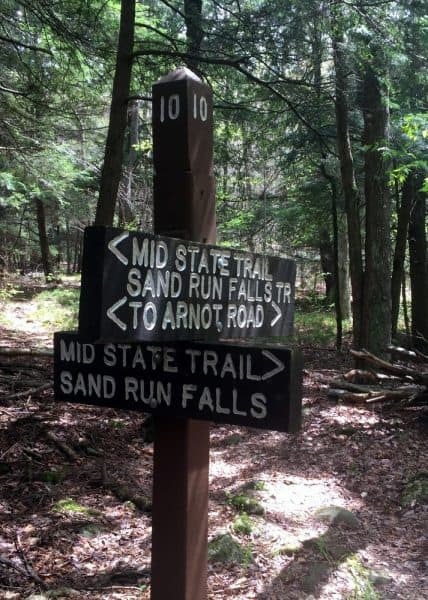 To get back to your car from Sand Run Falls, you have two options. The easiest is to retrace your steps and head back along the Mid State Trail to the parking area. 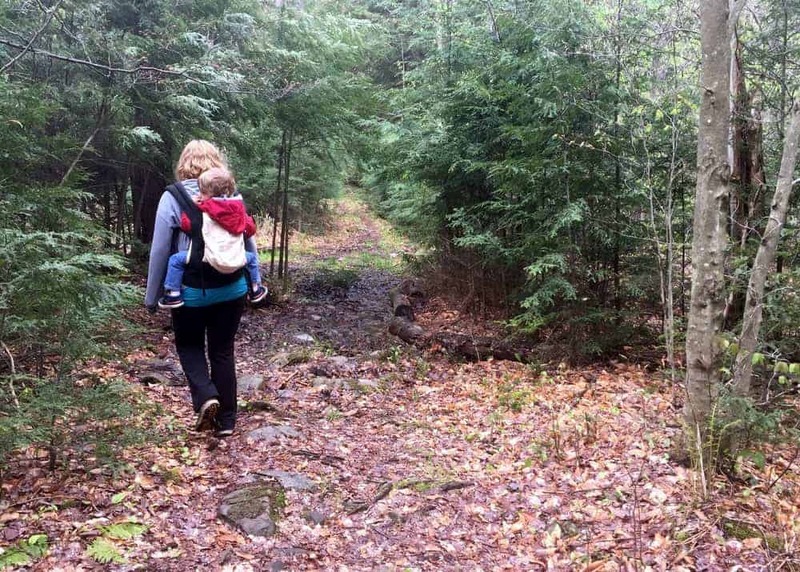 You can also hike back on the red-blazed Sand Run Falls Trail, which is what I did. While this makes a convenient loop, it’s worth noting that this trail is fairly overgrown and not very well marked, though it’s fairly easy to follow for the most part. Another look at Sand Run Falls. If you go this way, I’d recommend printing out a map ahead of time so that you can use it on your hike. However, even with a map, I still got turned around at one point, though I found my way out without too much trouble. 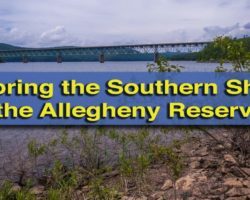 While it was nice to see different terrain, I’ll be taking the Mid State Trail both ways on my next visit to Sand Run Falls. 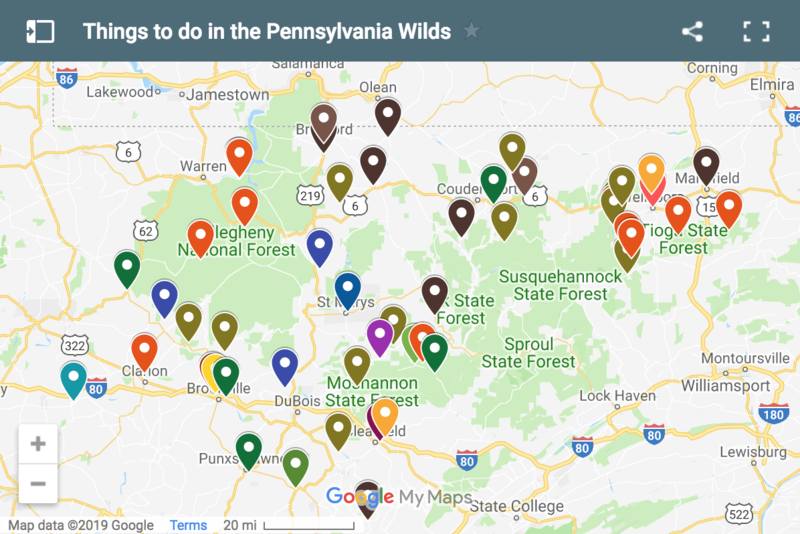 Without a doubt, there are many amazing outdoor adventures to be had in Tioga County, Pennsylvania. 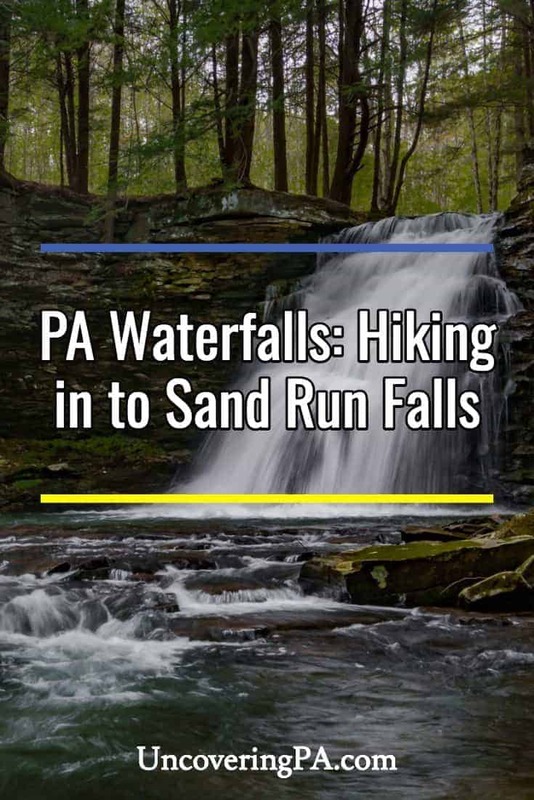 However, if you are looking for a great hike and waterfall away from the Pennsylvania Grand Canyon, the hike to Sand Run Falls should be on your short list. 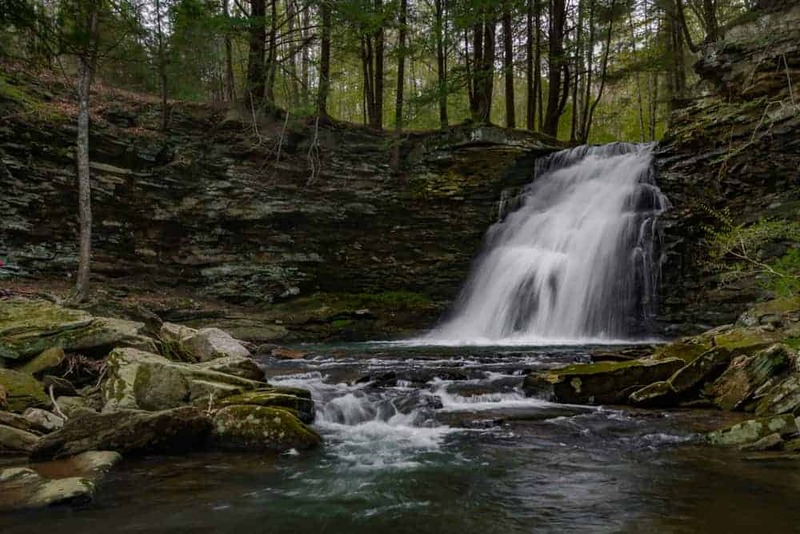 Sand Run Falls is located in Tioga State Forest near the small community of Arnot in north-central Pennsylvania. 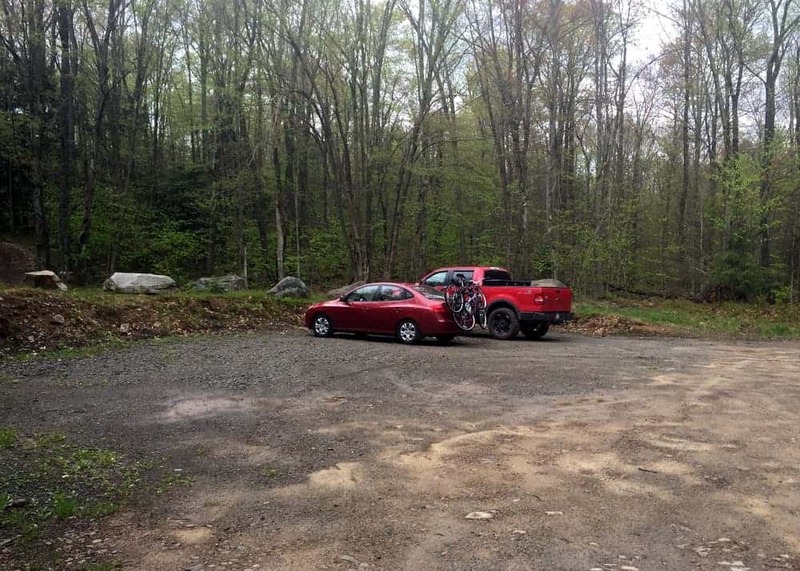 There is a dirt parking area which can be found along State Route 2016. 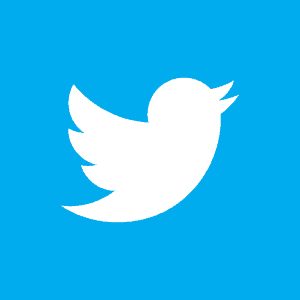 The parking area is located at the following coordinates: 41.681892, -77.154297. From here, do not follow the road beyond the gate unless you are planning to hike to the falls on the Sand Run Falls Trail. Instead, head back towards the road. Just down from the parking area, you’ll see a trail off to your left. This is the Mid State Trail. Follow this trail for approximately three miles until you reach Sand Run Falls. The parking area for Sand Run Falls. When enjoying the falls, make sure that you leave enough daylight to return to your car. 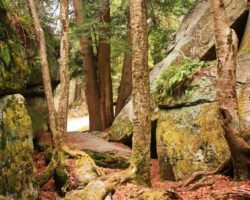 While the trail is relatively flat, it can take a while to hike three miles, and you don’t want to get stuck in the woods after dark. For those that hike with a GPS, Sand Run Falls is located at the following coordinates: 41.661823, -77.193993. 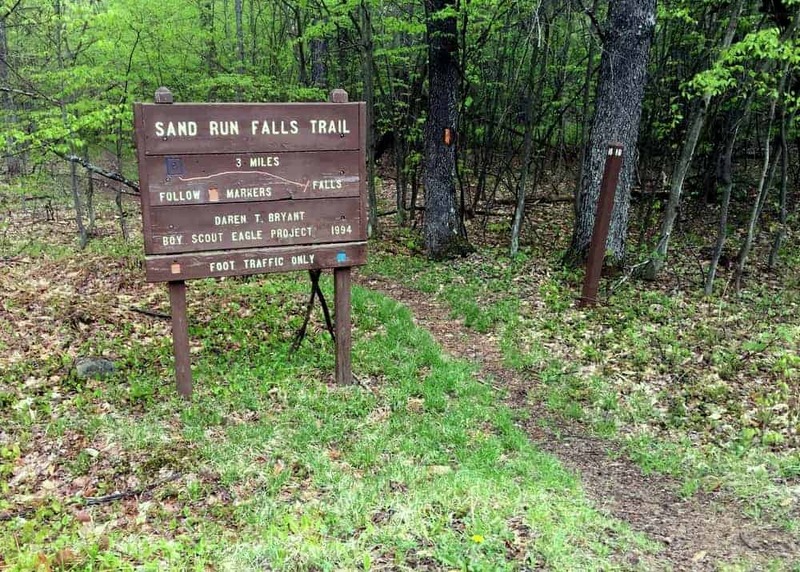 Look for this trail to start your hike to Sand Run Falls along the Mid State Trail (even though the sign says “Sand Run Falls Trail”). Before you leave, it’s best to familiarize yourself with the Sand Run Falls map put out by the state. I printed off a copy for myself so that I could reference it on my hike. 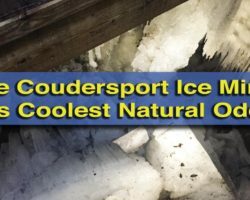 While the other waterfalls mentioned in this guide aren’t on the map, they are easy to find if you follow the information in this guide. For those that want to plan ahead of time, Rattlesnake Run Falls is located at approximately these coordinates: 41.663464, -77.196403. 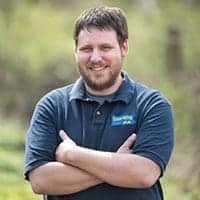 Nice comments and information about the extra waterfalls. 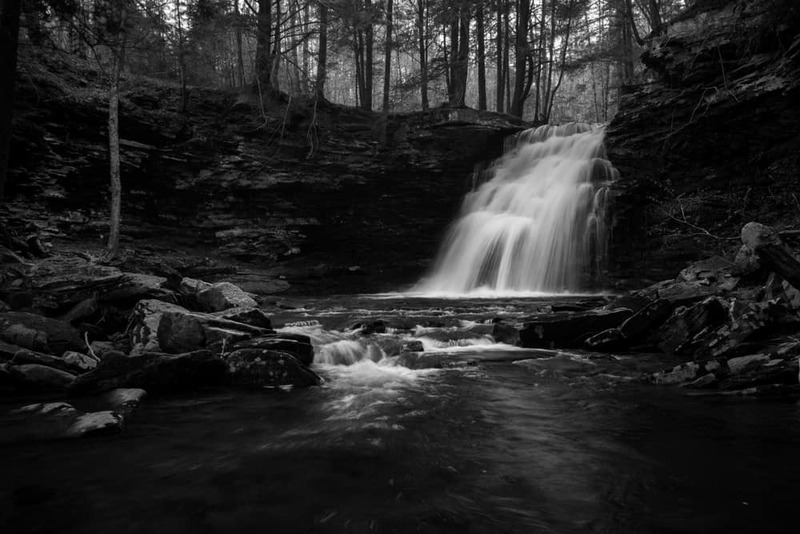 I have visited the area many time, sometimes entering from the Landrus road which gets to within a mile of the falls. 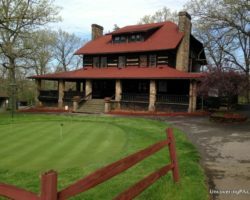 How’s the hike up from Landrus Road? I noticed that looked closer on the map, but couldn’t find any trail information.